Contents 8 Newsmakers » 14 Withering Heights » All insurers had a torrid time last year, but investors have singled out QBE for special punishment. 18 Repenting at leisure » IAG’s pursuit of failed insurer AMI has upsides – but some past romances have ended in disillusionment. 20 The market: Signs of life » Premiums are rising on the back of weather claims, reinsurance costs and low returns. 22 The pain begins » Local reinsurance rates moved sharply up in the January renewals, and there’s more to come. 24 The very model of a modern major disaster » How insurance companies – and their money – help communities pick up and keep going after devastation. 30 Lessons from the quakes » Canterbury businesses now know a lot more about insurance, and why having a broker is important. 32 Plotting a new course » After eight years as a niche insurer, Calliden is undergoing a makeover. companyNEWS 58 Back on the road again » Queensland’s floods didn’t keep these truck operators bogged down for long. 60 Bridging the gap » Market needs meet insurer ingenuity. 60 A healthy level of protection » National OHS harmonisation has placed statutory liability in the spotlight. 34 Tell it like it really was » How intermediaries can use the facts on what really happened after last year’s catastrophes to build opportunities. 38 Life & work in NYC » Want to take your skills and move overseas? Meet some transplanted Australians enjoying the ‘city that never sleeps’. 46 Steering straight in stormy waters » Uncertainty reigns in reinsurance as catastrophes multiply and economies turn down. 50 The worst of years » Earthquakes and floods ensured 2011 will be remembered as the industry’s most expensive yet. 54 Reinsurance helps us ride the storms » An insurer explains how reinsurance helps counter the various factors that push premiums up. Smith emerges at Axis Former Zurich Australia chief executive David Smith (left) was never going to stay out of the insurance game for long. After a break from the industry, Smith has emerged at the local arm of Bermuda-based Axis Capital Holdings as Chief Executive and Country Manager of Australia Operations. 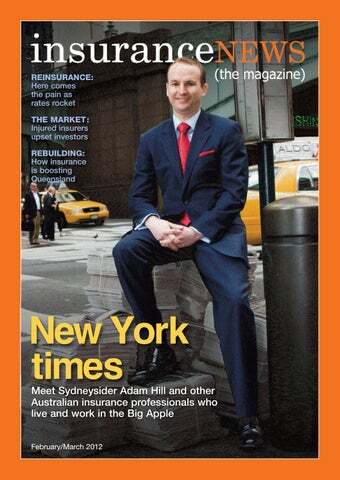 Axis has been active in Australia since 2005, and was licensed as an insurer in 2008. Smith left Zurich Australia in March last year after five years when the company was split into two separate divisions. In his roles at Zurich and as chief executive of IAG New Zealand before that he earned a reputation as one of the industry’s sharpest leaders, speaking out well before the pack on the need for standard flood cover and climate change education and measurement. Iles to guide UAC Specialist Underwriting Agencies director John Iles (right) has been elected as the new Chairman of the Underwriting Agencies Council. He replaces Damien Coates. Heath Amber (Millennium) is the new Deputy Chairman. Mr Iles, an expert in statutory liability, says underwriting agencies in the Australian market will enjoy a higher profile with brokers over the next year as the commercial market continues to harden. “It’s an ideal opportunity to demonstrate our strength and value in the market by providing viable options and resolutions for brokers’ clients,” he said. Suncorp’s new channel Suncorp is set to build a new stand-alone brand for its newly acquired AMP General Insurance Distribution business. The deal to buy AMP’s general insurance division – Suncorp already provided the underwriting – was finalised on January 1, and 700 authorised representatives (ARs) and 37 administration staff have moved across. Suncorp has a year’s grace to find a new brand to replace the familiar AMP logo. The AR has come of age in the past few years, with brokers and insurers alike realising the financial benefits of having staff working off a single Australian financial services licence, rather than one each. For Suncorp, it’s a whole new way of working into the commercial market, with Commercial Insurance Chief Executive Anthony Day noting that it will even enable Suncorp ARs to access competitors’ specialist products and services when it’s going to benefit the customer. New divisional general manager Gerard McDermott says his unit will “operate at arm’s length” from the other commercial insurance operations. Marsh sees rates rising It’s taken much longer than anyone imagined it would, but property rates in Australia are on the way up, according to mega-broker Marsh. Its annual Pacific Market Insurance Report, Navigating the risk and insurance landscape, says rates increased by 8-15% across all classes of risk last year. But while the natural disaster losses of the past year have been a major catalyst for raising property premiums, it’s a different story in the casualty market, where capacity is plentiful. Marsh says most premiums are flat and some clients are even obtaining reductions in premiums. Customers in Australia and New Zealand with a loss history are being stung the most in property premiums. And as is normal when the market hardens, the insurers are also seeking to tighten coverage restrictions. There are also new restrictions – or no coverage available – for buildings built in New Zealand before 1936, and no automatic reinstatement of insurance following damage from a natural disaster. The report says there may be a “mild withdrawal of capital” across the Pacific region as insurers experience their own capital and investment problems. damage could tip losses over $US1 billion. It’s the largest maritime loss event since the 1989 Exxon Valdez disaster in Alaska. Costa Cruises, the owner of the ship, has offered passengers €11,000 each in compensation, provided they drop any other litigation. Seventeen people are confirmed dead and another 16 are still missing. Lardner to up stumps One of the industry’s most popular leaders in recent years, senior Aon broker Steve Lardner (above), has announced plans to retire in July. The immediate Past President of the National Insurance Brokers Association and Chief Broking Officer at Aon, Lardner says he’s pulling the curtain on his career and is by all accounts looking forward to some much-deserved downtime. Lardner will retire from Aon Risk Solutions after handing over the chief broking officer job to Chief Placement Officer Bob Mann. Sydney-based Lardner, who began at Aon 21 years ago, has been “instrumental in establishing Aon as a market leader in this country”, Aon Chief Executive Steve Nevett says. Lardner’s announcement comes just four months after he was awarded the Lex McKeown Trophy for services to broking and the association. Suncorp Chief Executive Patrick Snowball arrived at the group’s Brisbane headquarters with a reputation for seeing value in outsourcing. But the number of jobs rumoured to be on the block at the giant insurer is audacious – even by his standards. Under the bland designation of “simplification”, Suncorp has signed outsourcing contracts with two Indian companies. Suncorp says 71 jobs are going to the subcontinent, alongside 50 layoffs announced in November last year. But Indian news reports – which Suncorp has refuted – say up to 2000 Suncorp positions are to be relocated. In an industry already spooked by large layoffs at major banks and internal reviews at CGU and Aon, the Suncorp offshoring rumours and Financial Services Union warnings are causing some consternation within the industry. will provide valuable competition to local insurers. Previous hard markets also attracted shysters who offered low premiums to high-risk companies hobbled by premiums they couldn’t afford. Bitter experience has revealed that those “insurers” were usually reliant on equally dubious reinsurance arrangements. Australia’s licensing and enforcement system has hopefully evolved sufficiently to keep such people toeing the line. Time will tell. In this edition we’ve compiled a range of articles and opinions that examine the factors steering the industry today. We’ve spoken to a global reinsurance expert to gain an impression of how the local market is regarded in the financial capitals; and we’ve interviewed leading financial analysts to understand the repercussions of under-performance from the viewpoint of investors. All this leads the discerning reader to wonder if insurers held on to that soft market for a bit too long. The legendary insurance cycle stayed at the “high investment yields/low premiums” end for a long time. Even when things were going bad through 2011, commercial premiums stayed remarkably stable. Should premium rates have been going up significantly in early 2011 or even late 2010? Or is the insurance cycle a phenomenon controlled only by a bewilderingly vast range of market forces? We can’t answer that one, but I hope you’ll find plenty of answers in this edition of Insurance News. “Hitting their guidance depends very much depends on cat outcomes over the next six months,” Mr Chidgey says. “That’s the big swing factor.” As Lori Dickerson Fouché, the Chief Executive of US insurer Fireman’s Fund, said recently, “Hope is not a strategy, as much as we would like it to be. 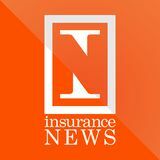 Underwriting discipline, operational effectiveness and pricing – these are the basics of running an insurance company.” Hope also isn’t a commodity analysts and investors normally buy. They want a return to the certainty they’ve come to expect from QBE, even at a time when other insurers are experiencing conditions every bit as * torrid. Mr Heargerty says that since the collapse of HIH Insurance, QBE has been steadily increasing its exposure to highly profitable – but volatile – property lines. More than 55% of QBE’s book is now property risk, up from around 40% 10 years ago. “If you look at one of their items, crop insurance in the US – that is clearly a recent acquisition that is more vulnerable to weather conditions,” Mr Heargerty says. The downside to higher margins is, of course, greater exposure to expensive weather events, no matter how rarely they actually strike. “They say the crop losses QBE has suffered in the US only happen once every seven years,” Mr Heargerty says. Deutsche Bank’s Mr Chidgey agrees. “Their business risk has changed through acquisition,” he says. “It seems that, indirectly at least, these acquisitions have put them into business lines which carry more cat risk.” So will QBE’s depressed balance sheet suppress its appetite for acquisitions? Most analysts believe it will. A rumoured move on HSBC’s non-life insurance operations, where QBE, Axa SA, and Ace are reportedly locked in a three-way $US1 billion “bidding war”, is likely to be bunkum. As for smaller bolt-on acquisitions, Mr Chidgey says the company’s weaker capital position affectively “ties its hands”. “Historically, QBE has been a very acquisitive company, but with their current capital position they can’t do that,” he said. “For now, it’s more about delivering on earnings and slowly, organically rebuilding that position.” Despite a dire start to 2012, QBE’s financials are still sound. In the past seven years, the group has averaged an insurance margin of around 18% and a COR under 90. Both its tangible book value and market capitalisation have also grown over the same period. Despite the huge devaluation in its stock value, QBE’s share price trend and those of the ASX 300 and financials are near mirror images of each other. Of course, problems do exist within the business. From a high of $35 per share in 2007, QBE is now languishing below $12. Between 2007 and 2010, its return on equity also fell from 25% to 13%. Dividend payment trends are also worrying shareholders. The anticipated second-half dividend payout will be at its lowest level since June 2004. Since reaching a high of 65 cents in December 2008, paid dividends have plateaued while franking levels – a measure of how much tax is pre-paid on a dividend by a listed company – have fallen from 50% in December 2007 to 10% in the first half of 2011. An upside for potential investors is that at its current sharemarket price, QBE is an absolute bargain. “It is cheap but there are question marks around margins and where they ultimately will be,” JP Morgan’s Siddharth Parameswaran said. Merrill Lynch’s Andrew Kearnan describes a “dislocation” between the company’s current share price and its earnings guidance. “QBE has missed earnings expectations for several periods now,” he said. “We sense investors will seek greater comfort on the factors driving the earnings misses and the state of QBE’s balance sheet before buying back in.” Alarmingly for QBE, hitting its 2012 forecasts of 89% COR and an insurance profit margin of 15% is almost completely out of its hands. Anything other than a quiet start to 2012 will almost certainly see future downward revisions from the insurer. Within that figure, Munich Re got increases in the low double digits for US natural catastrophe cover, and says prices were appreciably higher in Australia and Asia. The group expects further price increases from Japan in April and Australia and some American regions in July. However, the Guy Carpenter analysis says reinsurance capacity has remained largely intact, with relatively small amounts of capital withdrawn from the market. “With prices increasing to what many reinsurers perceive to be a more sustainable level, some underwriters have taken the opportunity either to increase shares or to return to a market where the pricing had been too challenging before.” Guy Carpenter says that although 2011 was the one of the worst loss years on record, reinsurers were better capitalised than at any other time of heavy loss. “Although much of the sector’s excess capital was reduced at mid-year, dedicated reinsurance sector capital finished 2011 near the same level where it began,” its report says. “Improvements in enterprise risk management and effective capital management contributed to the success and strength of the industry.” Willis Re sees the market segmenting, “with rate movements being driven by individual loss history and perceived exposure movements, rather than by an overall blanket increase”. The reinsurance broker believes rate movements are being driven by the challenge for reinsurers of making a profit when interest rates are low, rather than by capital shortages typical of a hard market. Willis Re Chairman of International Business James Vickers says that higher pricing for natural catastrophe risks has attracted fresh capital to the industry, primarily through specialised investment funds. He says that despite reinsurers’ reasonable levels of capitalisation, their earnings from investment income look increasing bleak. Aon Benfield Analytics says reinsurers were able to respond to a “seemingly unending series of catastrophes” in 2011, but the industry’s earnings and capital are challenged by low interest rates associated with sovereign debt issues in Europe and global economic uncertainty. The company says demand from US and European insurers for additional reinsurance remains very price-competitive. The July outcome will show just how much the reinsurers have * been able to talk up their prices. And insurers should be asking how businesses will deal with emergencies as part of the risk mitigation involved in providing cover. “Where is the board policy that requires management to have detailed plans, and why isn’t the insurance industry asking to see these documents?” He believes two plans are necessary, as the disaster response is about ensuring safety while a business recovery plan is about keeping the doors open. The disaster plan should ensure wardens are appointed to ensure emergency action is taken, that staff and everyone else on the site are safe, premises checked for safety and security and business records secured. On the day of the February 22 quake last year, disaster plans were thrown awry because the earthquake occurred during the lunch hour, when many fire wardens and other key staff were out of the building. Mr Livingstone says the event has shown that back-up people are needed when fire wardens are absent or cannot cope. From his interviews following that quake, he estimates about half the designated fire wardens did not perform their duties. Some were on leave or out, and others were more concerned with checking on their families. Often people who were natural leaders emerged and took charge. In the months afterwards, business-owners who could move to new premises still found it virtually impossible to restart quickly if their main computer server was not accessible and the backup was inadequate. Others found that their customers were no longer in business or, for retailers, there were no shoppers coming into the city and surrounds. “Some people actually said ‘we had it all covered for in our business, but we didn’t expect half of our staff would not be there’.” As the aftershocks continued, employers found staff would leave to see if their children were safe, or sometimes felt so jittery they couldn’t make it to work. Mr Livingstone says these “soft issues” emerged repeatedly when he spoke to company managers. As they moved into the business recovery phase, employers spoke of the problems with absenteeism and increased turnover as people decided to leave Christchurch. Managers of manufacturing businesses told him about staff who could not cope having to be removed from operating machinery. The health and safety officer at one site interviewed all the staff and decided about 10% were “flaky” or struggling to some degree. Although Mr Livingstone believes businesses suffered when managers failed to empathise with staff, he says there has been a huge toll on executives and managers trying to keep the business running while dealing with traumatised staff and their own personal difficulties. General managers found themselves doing things like having to drive to supermarkets to get lunches every day because there were no local cafes open, while being unsure how many employees would turn up for work and whether clients wanted to place orders. “Their whole production schedule had gone out the window,” he says. “They might not even have all the staff they need to run some machines.” Mr Livingstone says data backup must be at least five kilometres away and the business recovery plan needs to address options for other sources of telephones, internet and power as well as possible alternative premises. “You also have to have a ‘practice’ disaster and test your plan, your back-up and recovery. Insurers can ask about this.” Business-owners seeking insurance expect to be asked about their risk mitigation, and Mr Livingstone says the insurance industry can play a key role in reducing losses and keeping firms in business by creating ex* pectations that their clients will be prepared for disaster to strike. aster pools, but ultimately we need people to understand the risks they face and to make sure that they’re adequately insured against those risks. The Insurance Council’s 10-point plan requires a co-ordinated effort from both the public and private sectors to ensure future generations are properly informed, prepared and insured against the natural perils that are part of the Australian landscape. The events of the last 12 months do create an opportunity for brokers to re-evaluate the way they sell to both new and existing clients. These events remain in the consciousness of all Australians. If brokers can do anything differently, I’d hope they can explain to their clients the contribution our industry has made and where the insurance cycle is at present. Most importantly, brokers can ensure clients have adequate sums insured, appropriate levels of business interruption insurance and a clear understanding of the coverage and limits they have. Of the 25,000 claims QBE received from Australian catastrophes in the first 90 days of 2011, fewer than than 1% went to internal dispute resolution, and of those less than a third were referred to the Financial Ombudsman Service. I attribute these figures to those clients who had an advocate working with them to lodge claims and resolve issues; a broker who enabled them to be better informed about their policies. It’s an often underused, but very real reason why clients should use an intermediary. The facts are out there, readily available for brokers to use to assist in building understanding of the value they and the wider industry add. For brokers, the benefits are many – with growth in their businesses and the level of cover their clients should have * hopefully at the top of that list. â&#x20AC;&#x153;The people here have learned to make the most out of limited spaces for living and recreation.â&#x20AC;? Uncertainty reigns in reinsurance as catastrophes multiply and economies turn down By Terry McMullan THE ROLE OF REINSURERS IS PROBABLY better understood by the general public now than ever before, even if the pressures and priorities that drive the industry aren’t. The sector is riding a wave of uncertainty at present, reflecting both the size and severity of global catastrophes in 2011, and also the troubled state of the global economy affecting the investments that underpin reinsurers’ stability. Like most major global reinsurers, Gen Re – a significant part of the Berkshire Hathaway empire – is focusing on steering a straight course in an increasingly uncertain world. As Gen Re Corporation President John Cholnoky sees it, it’s not that risk in the region has changed; it’s just the perception and understanding of what that risk really is. Mr Cholnoky accepts that right now uncertainty is a common problem that’s affecting almost every area of the reinsurance business at present. And that includes rates. “There is uncertainty about the health of the global economy and unprecedented volatility in financial markets around the world,” he says. “It’s a challenging operating environment for both the insurance and reinsurance industries around the world. “Interest rates are depressed globally, and this is having a significant impact in the systemic reduction of insurance companies’ operating income. And we have the spectre of inflation to add to the challenges going forward.” Mr Cholnoky told Insurance News during a visit to Australia late last year that while some reinsurers may have to reassess the risks they cover and the amount they charge, that’s not how Gen Re works. “We focus on assessing underlying exposures, being transparent and treating clients fairly, and that will not change. “We try to look at each client, their portfolio and experience, individually. We don’t take a ‘market’ approach when it comes to assessing appropriate rates. “Having said that, catastrophe experience has been well outside of both general and modelling expectations, so logically some adjustment to reflect that makes sense. “The La Nina weather system has been singled out as a prime cause of most of the major weather-related catastrophes last year.” epicentre was located at a shallow depth and only a few kilometres from the city centre. Munich Re estimates the economic losses at around $US16 billion, of which about $US13 billion was insured. Tremors continued throughout the year, including three strong earthquakes on December 24. The La Nina weather system has been singled out as a prime cause of most of the major weather-related catastrophes last year. It contributed to extraordinary flooding in Australia, as well as Cyclone Yasi, which cost insurers and reinsurers about $1.3 billion. La Nina is also blamed for massive flooding in Thailand in the last few months of the year. It also influenced windstorms in the United States through the middle of the year, with cool weather fronts from the northwest moving over the central US and meeting humid warm air in the south. The result was the worst tornado season on record – even worse than 2010. Tornadoes caused economic losses totalling about $US46 billion, of which $US25 billion was insured. Insured losses were thus twice as high as in the previous record year of 2010. A particularly active North Atlantic hurricane season was also expected, but although the 18 severe storms that did form was well above the long-term average of 11, only six became hurricanes. While only three hurricanes made landfall in the US last year, one of them, Irene, traveled from the Caribbean to southeast Canada, causing $US7 billion in insured damage. The floods in Queensland and Victoria during the southern summer last year caused insured losses estimated by the Insurance Council at about $2.5 billion. But this cost was dwarfed by the floods in Thailand that inundated the country’s central plain, swamping hundreds of thousands of homes and seven giant industrial areas where factories owned mainly by Japanese companies were situated. Thailand’s rainy season usually starts in May and ends in October, but weather experts say the La Nina phenomenon started early and continued on past April-May, when it usually peters out. This led to a protracted and intense monsoon season that forced authorities to release stored water from dams, causing the Chao Phraya River to flood. The world is now experiencing shortages of vital electronic components and some vehicles that were manufactured in factories in central Thailand. Swiss Re has placed insured losses from the Thailand floods at $US8-11 billion, although some estimates have been much higher when claims related to * global commercial supply losses are added. Regulatory requirements The Australian Prudential Regulation Authority (APRA) requires insurers to buy a minimum amount of catastrophe reinsurance. The current prudential standard is for a 1-in200 year event. Now APRA is expected to bring in a new set of standards that will require insurers to set aside more capital and/or buy more aggregate reinsurance cover. But reinsurers have the capacity to provide reinsurance even if insurers have to increase their reinsurance needs. Global reinsurance capital levels remain strong and competition between reinsurers for business is still competitive. The increase in the number and severity of natural catastrophes has had a significant impact on the industry. The claims from the severe weather catastrophes that hit globally – including Australia, Japan and New Zealand – are currently estimated at more than $US430 billion. This compares with the average annual economic loss of $US89 billion from 2004 to 2010. With any major loss – that is, anything over $500 million – reinsurers bear 75-95% of the total insured loss, thus reducing the cost of claims to insurers and, ultimately, consumers. Claims costs are significant for insurers and, obviously, affect the overall costs to the consumer. Without reinsurance the ultimate costs would probably see insurance become too costly for much of the community. Investments The current global economic uncertainty and volatile financial markets are expected to continue throughout the coming year. The underlying strength of the local economy should once again protect Australia from the full impact of the global issues. The state of investment markets has a profound impact on insurers, which rely not only on premium income but also heavily on investment income. The general insurance industry is much less exposed to equity markets than life insurance. However, the general insurance industry has – at present – a larger exposure to credit spreads, given its substantial fixed-interest portfolios. According to APRA, the local industry bounced back from last year’s disasters, although a $217 million loss for the sector was recorded in the September quarter. But APRA noted that income from investments helped turn around the underwriting losses, despite the volatility of global markets. During the 2011 September quarter, insurers managed to increase their investment totals from $63.7 billion in September 2010 to $66.5 billion. “Hardening markets are often influenced by increasing costs in reinsurance, but in the current climate it is insurers who are taking the lead, with some of the benefits being passed on to reinsurers.” • Parts of southeastern South Australia and western New South Wales are more likely to have a drier summer. So the threat of floods and bushfires has not gone away. State and Federal taxes and levies have a major impact on the cost of premiums, with insurers finding themselves acting as tax collectors. Taxes on insurance have escalated considerably in recent years – from $2.1 billion in 2000 to $3.7 billion in 2006. Industry estimates show that about a third of the cost of insurance to a small business is in the form of taxes. A hardening market This happens particularly when all insurers in the local market are suffering, but they can also be undermined by offshore companies or new entrants who seek to opportunistically gain market share by undercutting rates. Hardening markets are often influenced by increasing costs in reinsurance, but in the current climate it is insurers who are taking the lead, with some of the benefits being passed on to reinsurers. The future Mr Day says he doesn’t doubt that as Australia faces another year of potential major natural events insurers “will again turn to reinsurers to help them – and, more importantly, their customers – ride the storm”. A healthy level of protection: National OHS harmonisation has placed statutory liability in the spotlight STREAMLINING THE MYRIAD OCCUpational health and safety (OHS) laws that abound in Australia makes sense from a national viewpoint, but how does it affect insurance coverage? As federal, state and territory governments inch closer to a uniform OHS framework, underwriters have been tackling policy wordings and protections on a national level – a key concern among insurance brokers. Currently New South Wales and Queensland have passed legislation aligning OHS laws, with Tasmania and South Australia soon to follow. National health and safety laws have been on the agenda since 2008 as a central means of stemming the cost of work-related injures and illnesses, estimated at about 6% of annual GDP. Increased fines of $3 million for a corporation, $600,000 or five years’ jail for an officer and $300,000 or five years’ jail for an individual accompany the new laws. Specialist Underwriting Agencies Director John Iles says companies are seeking secure insurance arrangements to meet the demands of the national OHS system which came into force on January 1. “There has been some concern from brokers about how harmonisation will effect policies,” Mr Iles says. To ease such concerns, SUA has released a new Corporate Practices Protection policy, based on a previous Business Practices policy that has been modified for the broader corporate sector. The policy covers almost all acts of Parliament covering OHS, an improved Inquiries Costs Indemnity cover and a Reputational Expenses inclusion covering the cost of a communications consultant during an event. Mr Iles says the policy is the only one of its kind to provide indemnity for enforceable undertakings and associated legal costs to negotiate a settlement. “Every policy that we have seen covering statutory liability talks about penalties that are payable to the regulatory authority, but enforceable undertakings are payable to any third parties,” he said. “The reputational expenses cover is also quite a new one for larger entities.” Insured definitions have also been extended to cover all employees, not just directors and officers and can be extended to cover voluntary workers. Indemnity limits of up to $5 million are also available. “We believe this is the broadest statutory li* ability policy in the market,” Mr Iles says. “However in this instance it was applied to a liability policy, giving third-party claimants precedence over the insurance funds, thereby over-riding the contractual agreement between the insurer and insureds.” Zurich’s new “companion” policy provides accompanying cover for insured persons “Side A” and company reimbursement “Side B”. Non-aggregating capacity of up to $10 million is also provided. Chartis Commercial Institutions Manager Financial Lines Jeremy ScottMackenzie says the Bridgecorp ruling has added another layer of uncertainty. “We thought it pertinent that a solution be offered to our clients in Australia who seek the comfort of an additional level of protection,” he said. Chartis’ new D&O Gold Costs and Expenses Policy acts as a companion to the company’s existing D&O Gold product suite to defend a director should payment from the existing D&O limit be prevented. Directors with this policy will have the means to fund their defence where their existing D&O limit is subject to a charge. Navigators Group’s “NavDefence” works in a similar way to cover defence costs where a charge has been placed on the main D&O policy. The group’s Lloyd’s syndicate, Navigators Syndicate 1221, underwrites the product. Syndicate head Carl Bach says the New Zealand High Court ruling has spawned an emerging risk that Navigators hopes to ad* dress. Comrades on the track: posing with fellow Kokoda Track trekker General Peter Cosgrove (centre) are, from left, Jason Howard of Chubb Insurance and IAA managers Helen Moore, Adrian Kitchin, Drue Castanelli, John Burke and Jill McMillan INSURANCE BROKERS HAVE STOOD shoulder-to-shoulder with members of the Australian Defence Forces in an annual pilgrimage along the Kokoda Trail. Nearly 70 years have passed since Australian soldiers battled Japanese forces in the jungles of Papua New Guinea in a campaign now encoded in our national psyche. The inaugural RSL Soldiers Kokoda Trek saw 50 hikers, including employers of Insurance Advisement Australia (IAA) and army veterans, complete the nine-day, 96km hike through the Owen Stanley Range. IAA was the major sponsor of the inaugural RSL Soldiers Kokoda 2011. IAA Director Adrian Kitchin says the broking group will continue as a major sponsor for at least the next three years. A touch of the Orient The Year of the Dragon is considered the luckiest of the Chinese zodiac, and Adelaide-based MGA Insurance Brokers will be hoping some of that luck rubs off in 2012. Getting celebrations off to an early start, delegates at the MGA Broker Assistants Conference in Adelaide were treated to an afternoon of dragon boat racing along the Torrens River as part of a two-day conference. More than 50 delegates flocked to Adelaide’s Intercontinental Hotel for the fourth annual conference, where industry legend Frank Hoffman ran a series of technical workshops before several breakout sessions. The gala dinner was held at Jolley’s Boathouse and attended by 110 guests, including MGA Chairman and co-founder John George. The location of next year’s conference? That’s a closely guarded secret. Prost! Allianz cheers its star brokers Beer, bratwurst, Brownlow and Blue Eagles kept Allianz and its broker partners occupied during a week of activities in Western Australia late last year. Beginning with broker training in Fremantle, Allianz hosted motivational speaker Matt Church before members of the One Allianz team spoke about workersâ&#x20AC;&#x2122; compensation, injury management and motor fleet among other topics. A luncheon for Allianzâ&#x20AC;&#x2122;s Blue Eagle brokers was later held at Matilda Bay Restaurant, where a Brownlow Medal-style countdown was conducted by WA State Manager Brett Jackman to announce the five brokers attending the Blue Eagle broker event in Queenstown, New Zealand. Delegates concluded the week with an Oktoberfest dinner at Elmars in the Swan Valley, complete with jugglers, firewalkers and clowns. Reaching out and digging deep Comedy duo Hamish and Andy, comedian Anh Do, Miss Universe Australia Jesinta Campbell and Melbourne Demons football great Jim Stynes were among a starstudded list of guests for the annual McLardy McShane Reach Christmas Lunch in December. Hosted by Melbourne insurance brokers McLardy McShane, the event attracted more than 600 people drawn from the industry and the wider community. The annual lunch raises money for the Reach Foundation, supporting young people. Guests at the lunch, held at the Melbourne Docklands venue Peninsula at Atlantic, raised $155,000 for the charity. Insight’s view getting better all the time Insight Insurance Brokers Association business partners and industry supporters drank in some spectacular views – not to mention a few cocktails – during the broking group’s annual meet and greet in Sydney a few weeks ago. Held at the Harbour View Hotel, the cocktail party marked the appreciation of Insight members and their strategic partners for the support the association has received in the past year. More than 65 members and partners attended the function. Insight has increased its membership numbers from 15 to 46 in the past five years and now has 190 participating branches nationwide. eQuipping young professionals eQuip, QBE’s special training initiative for young professionals, recently continued a series of annual graduation dinners to celebrate the successful completion of the formal learning component of the program. Hosted by QBE’s General Manager Australian Intermediaries Shaun Standfield, the dinners also provided an opportunity to officially welcome the class of 2012. Program graduates are invited to join the eQuip alumni so they can maintain and enhance the industry networks they have started to develop. eQuip gives participants resources and tools to maximise their professional development and mature in their roles as the future leaders of the Australian general insurance industry. Over the next year the class of 2012 will complete three modules – leadership, insurance acumen and sales and relationship management – the key competencies QBE believes will drive ongoing success. Our pictures were taken at the Sydney, Perth and Brisbane events. speak” words and phrases. His list is very long and often hilarious, and I offer only a small sample of his vast collection here, which you’ll see is in three separate lists. The words: 1. Integrated. Total. Systematised. Synergised. Parallel. Functional. Responsive. Synchronised. Balanced. Best practice. Upskilled. Rationalised. Conceptualisation. 2. Management. Organisation. Monitored. Reciprocal. Digital. Blamestorming. Logistical. Transitional. Incremental. Workshopping. No-brainer. Over-arching. Maximised. Relational. 3. Option. Flexibility. Capability. Mobility. Outside the square. Contingency. Strategic objective. Fiscal boundaries. Mission statement. Life cycle. Mindset. Core competency. Hard yards. In my friend’s own words: “Just integrate any of the phrases or just mix’n’match any of the words from any of the three lists into your next inter-office corporate memo or presentation, and you’ll get your message across without ever revealing your true thoughts or even if you have any.” Every company uses its own patois when applying corporatespeak, so make up your own list to complement this base list. Keep an eye out for them – they’re everywhere. Please send any great examples on to me. For now, to help you get moving, here’s one I prepared earlier: “In regards to your recent email, I am forced to respond with parallel reciprocal flexibility in presenting a systematised relational mindset. The over-arching strategic objective of course requires a synchronised capability for the life cycle of the project, which may preclude the contingency of workshopping this through conceptualisation.” Translated: “Got your email. I like the idea. Let’s work on it together and see if it’s feasible.” And that’s all it takes. Use corporatespeak as often as you can and you’ll notice after a few days that your brain is definitely lighter. Someone told me this is a true story. A young insurance executive was heading out of the office late one evening when he met the chief executive clutching a piece of paper and standing beside the office shredder. “Can you help me?” said the boss. “My EA has gone home and this is a really sensitive document. Can you make this thing work?” “No worries,” said our executive. He took the paper, inserted it and pushed the button. “Thanks for that,” said the boss. “I only need one copy.” The moral of the story: Don’t assume your chief * executive knows what he’s doing.